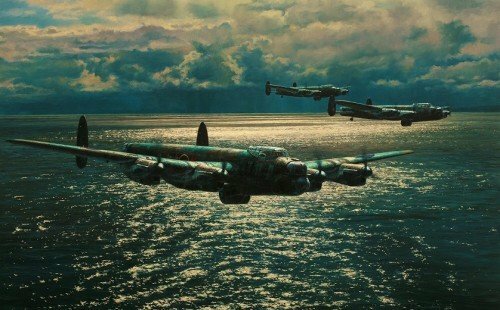 With silver moonlight glinting on the wave tops below, Guy Gibson leads the first wave of Lancaster’s low across the North Sea to avoid enemy detection, on the night of 16/17 May 1943. In formation with ‘Mick’ Martin on his port side and ‘Hoppy’ Hopgood to starboard, Gibson heads towards the Dutch Coast and the Ruhr valley beyond - their mission, the destruction of the Mőhne and Eder Dams. Within an hour he’d selected the aircrew; the very best in Bomber Command. Exactly four days later Squadron ‘X’ - soon to become 617 Squadron - was ready at RAF Scampton. Many familiar faces were there to meet him: amongst the pilots he spotted ‘Hoppy’ Hopgood, Dave Shannon from Australia, together with ‘Dinghy’ Young. The tall, figure of New Zealander Les Munro was there along with David Maltby. The big, beefy American pilot Joe McCarthy and his Bomb-Aimer George ‘Johnny’ Johnson were also called in, as was Australian Mick Martin, the expert in low-level flying.